Ugggh.. we're in the days of the challenge that I am not a huge fan of.. inspired by.. siiiigh.. we shall see how this goes! For this day, I just went with the name of a nail polish.. and I took a really easy route. 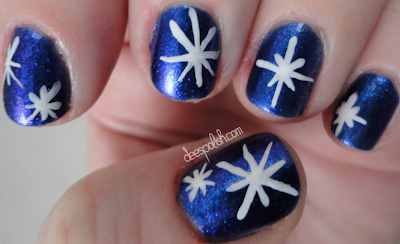 My polish name is 'Celestial Star', so I made really simple line-star shapes. Did and done! The polish used is Quo by Orly Celestial Star, and then I also used China Glaze White on White. Super easy. I had to clip down my nails - again! My thumb nails took some weird beating while running errands the other day.. easier just to cut down all my nails - plus they are getting kind of weak and gross looking from the challenge activity, but that isn't so bad.